As much as I like to see new products enter the market, it sure can make things confusing for the consumer. Nowhere is this principle more displayed than in the world of riflescopes. Disassembling a scope to see how it’s made isn’t an option, so we’re mostly left to deciphering whatever the manufacturer chooses to put in front of us. Some of the terms such as “multi-­banded coatings” sound awesome, but it’s difficult to understand what it really means without being an optical engineer. Fortunately, Bushnell’s three new product lines — Prime, Nitro and Forge — are pretty straightforward and easy to understand. The Cliff’s Notes version is that there is something for everybody. 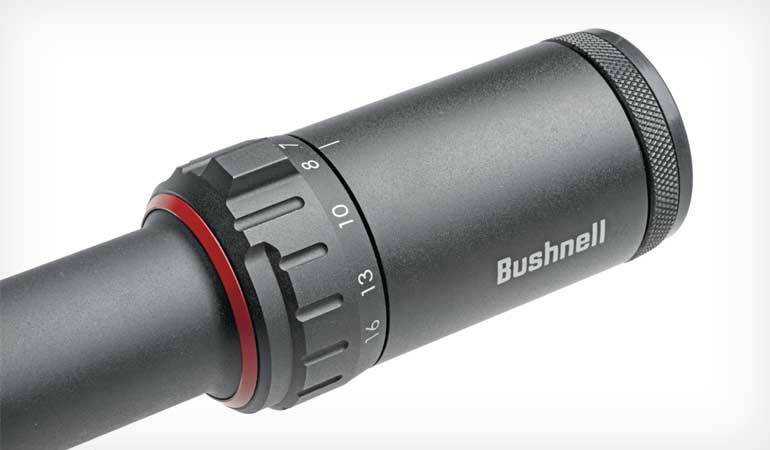 Bushnell’s new and affordable Prime line has mostly fixed parallax. A variable parallax is available on the 3.5-10X model. This line is the least expensive. 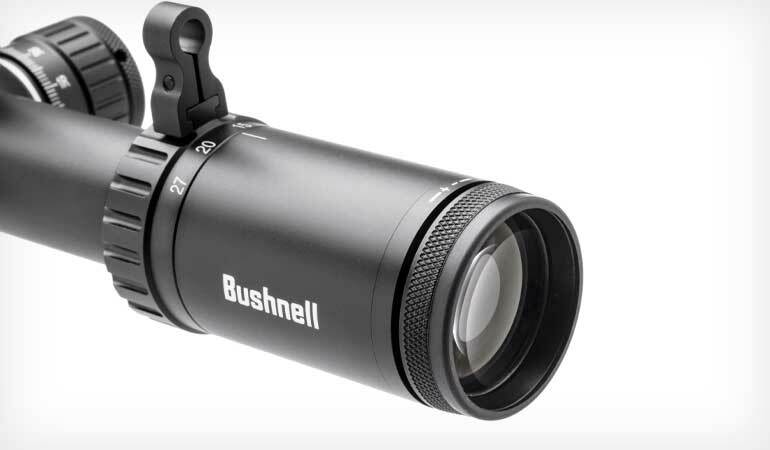 Bushnell manages to keep costs down by offering only the basic, most-­needed features. Take reticles, for example. Reticles in the Prime line are limited to the Duplex-­type. 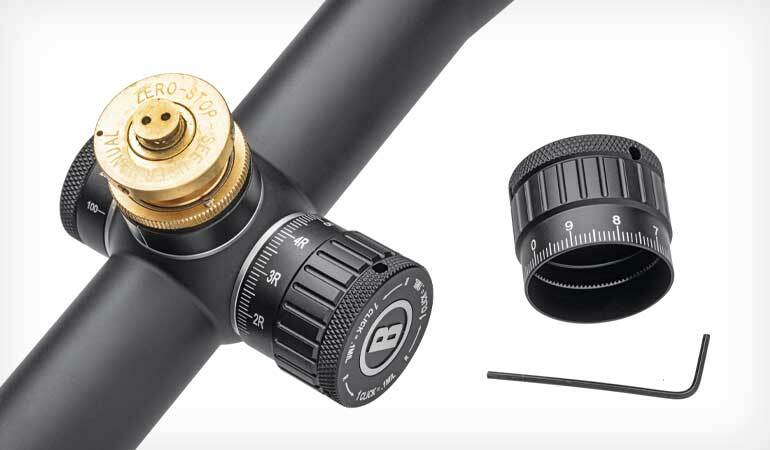 The Duplex reticle might not be the new hotness, but one could correctly argue that it’s been getting things done in the fields since grandpappy was young and spry. Not without modern features, however, Bushnell applies their EXO coating to both the objective and ocular lenses in the Prime line. Every once in a while, modern manufacturing comes up with something new that is truly noteworthy. This EXO coating is just such a creation and I found it used on all three new scope lines. Removing the Prime’s internal caps exposes the erector adjustment screws that are slotted for use with a screwdriver. EXO is a coating that fuses to the lens and makes it super slick. It’s hard for dirt to stick to the lens and makes water just up and run away. 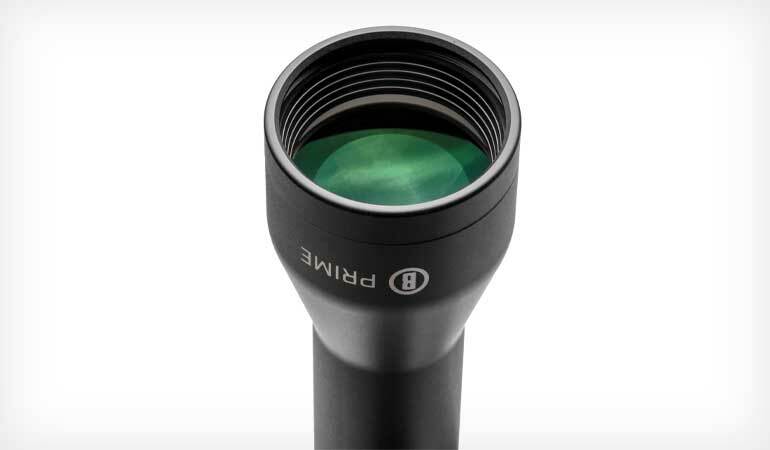 During a closed-door meeting at the 2018 SHOT Show, Bushnell representatives demonstrated the resistance of the coating by drawing a heavy line on the objective lens with a Sharpie. The mark wiped right off. Typically, when rain gets on the scope’s ocular lens (i.e., the lens closest to your eye), the water turns into beads. The problem is that your eye wants to focus on those beads, which will also grossly distort the image passing through the scope. By far, this is the most common issue shooters have to deal with in inclement weather when the target is in range. With Bushnell’s EXO coating, water on the ocular is no longer a problem. Even a fine mist beads and rolls off the lens. The fact that Bushnell includes this premium coating on an entry-level line, as well on their premium brand, is a significant value-added feature for consumers. While Prime scopes may have the most relevant premium coating with EXO, the rest of the feature list is pretty basic. For example, all Prime optics have 1-­inch maintubes, which limits elevation and windage travel in the scope, and the turrets are capped. That means they’re made to be zeroed at one distance and left alone. In our testing, the optical image quality was good, making these scopes a great value. Marked with red accents, the Nitro line features a 30mm maintube and wider magnification range. Stepping up to the midrange lineup, the Nitro opens up a series of options that may or may not be relevant for the rifle shooter. If a guy wants to be able to holdover with the reticle to shoot targets accurately at more than just the zeroed distance, the Nitro’s Deploy MOA reticle is quite capable. This reticle subtends at each minute, so using it is simple enough with any ballistic calculator that generates holds. This allows for accurate shot placement at any realistic distance. Also, with the Nitro line comes a 30mm maintube. The myth exists that a larger maintube allows more light to pass through the scope. This is not true. 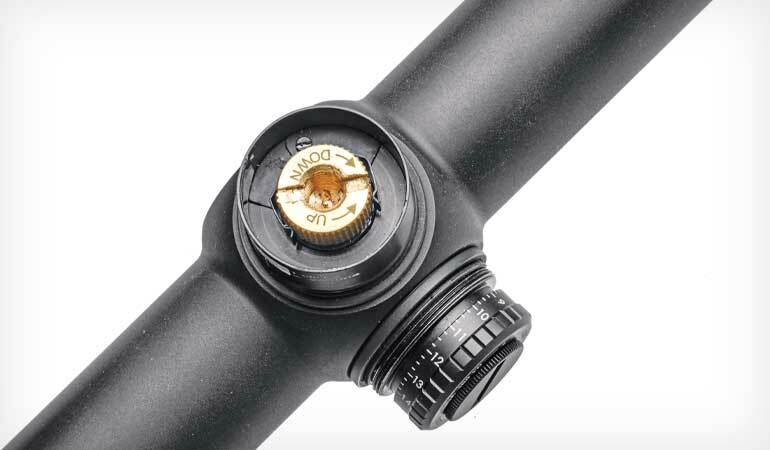 However, a larger maintube usually allows more elevation and windage travel than a scope with a 1-­inch maintube. Since the elevation turret is capped on the Nitro line, elevation and windage travel only really matter when getting the scope zeroed. 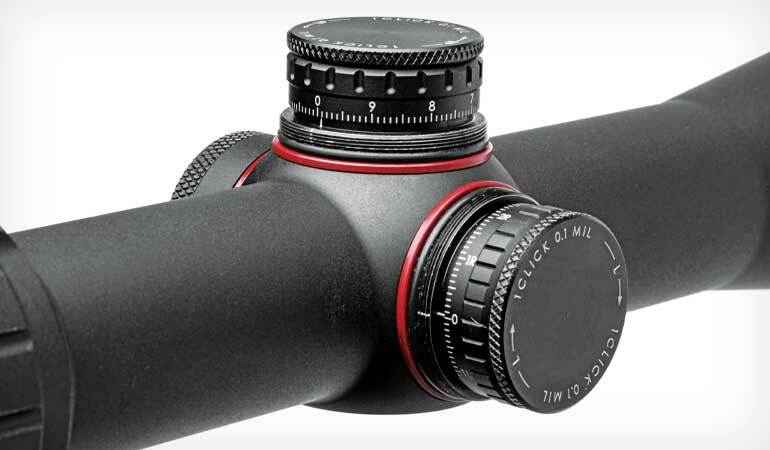 While elevation and windage turrets are capped on the Nitro line, the scopes do come with a parallax adjustment knob. Each Nitro scope comes with a parallax adjustment turret instead of just having fixed parallax. This somewhat innocuous feature removes the greatest source of optics error that I’ve encountered. Most shooters struggle with understanding parallax and recognizing it’s subtle yet highly negative impact on precision riflery. Parallax occurs when the target and reticle are not in the same focal plane. Parallax elimination happens when the shooter first focuses the reticle to his eye (a one-­time operation) and then uses the side-­focus knob to sharpen the image seen in the field of view as much as possible. If your groups move around on the target from one day to the next by about an inch or less, there is a good chance that there’s still some parallax in the scope. The Nitro line, with the addition of a side focus knob, gives the shooter all the tools needed to remove parallax and eliminate the wandering zero. The Forge includes additional windage and elevation adjustment, a power lever and extra low-dispersion glass for ideal image quality. The Forge line has the most options of all Bushnell’s new offerings. It incorporates all the features of the Nitro and adds an exposed windage and elevation turret, a zero-­stop, a power-­adjustment lever, more elevation and windage adjustment and extra low-­dispersion (ED) glass in the objective lens assembly. I did all of my performance testing with the Forge 4.5-­27x50mm. Exposed elevation turrets are essential if the shooter desires to rapidly dial elevation for targets at varying distances. Say the zero is at 100 yards, but the shooter wants to engage targets at 320, 473 and 722 yards. A ballistic calculator and an exposed elevation turret make this possible. A zero-­stop is a nice feature to have when combined with an exposed elevation turret. This feature allows the shooter to simply spin the turret until it stops to return to zero. Having a zero-­stop means no more misidentifying which revolution the turret is on. I did a tracking test on the Forge to see if the elevation turret performs as advertised. Often there is error in most elevation turrets and the further you dial the turret, the more the error shows up. I zeroed the scope on a custom precision rifle chambered in 6.5 Creedmoor and started shooting. I had no MOA bias in the mount and I was only able to dial 10 mils of travel. Ten mils took my 6.5 Creedmoor out to 1,250 yards. If you want to shoot farther than that, put the Forge in a 20-MOA-bias mount, as Bushnell encourages. The zero-stop exposed elevation turret takes the guesswork out of knowing on which revolution the turret sits. While playing with the Forge, I couldn’t help but appreciate the ED glass. This lens material is more expensive than regular glass, but it does improve resolution and contrast. Also worth noting, the power-adjustment lever made zipping from one magnification setting to the next a snap. 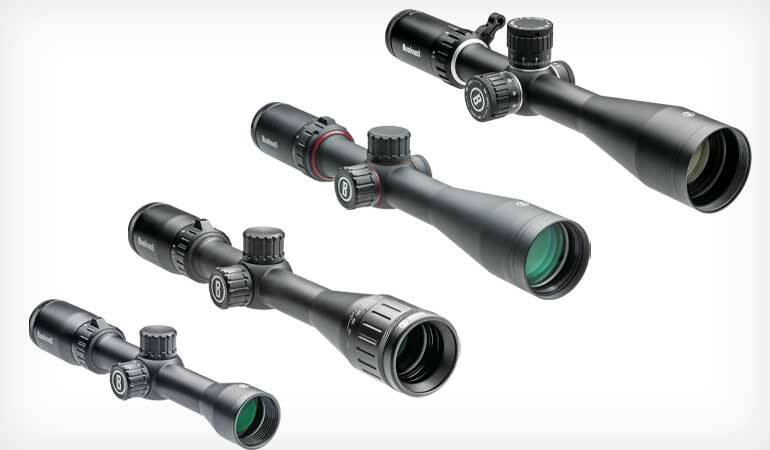 Whether you just need an inexpensive scope for sitting in the deer stand or want to dip your toe in long-­range precision shooting, Bushnell has each base covered with these new products. The sales price range from the least expensive Prime to the most expensive Forge is $130 to $1,000-­ish. This means there’s a scope to meet just about everybody’s budget.